September 9, 2016 - Every year for the past several years, Christine Espinoza would ask her grandfather if he’d like to join the family reunion on Labor Day Sunday. Christine’s grandfather is Elston Hazen, a Care Initiatives Hospice patient who resides at Southridge Specialty Care in Marshalltown. The family reunion was set in LeGrand, about 15 miles away. When RN Case Manager Darci Dooley learned about the family reunion and Elston’s desire to attend, she called on her Hospice team member social worker Judy Porter for some help. “I put out several calls but didn’t really find any answers, so I called Central Iowa Health Care/Marshalltown Hospital to see if they could help,” Judy said. Jesse and Tanner Wolken, a Toledo Ambulance Service colleague, offered to pick Elston up in an ambulance and take him to the reunion for an hour or so…all at no cost. “There were so many tears shed when my grandfather arrived at the reunion. So many of my family members were so happy to be able to see him and Grandpa was smiling ear to ear,” Christine said. 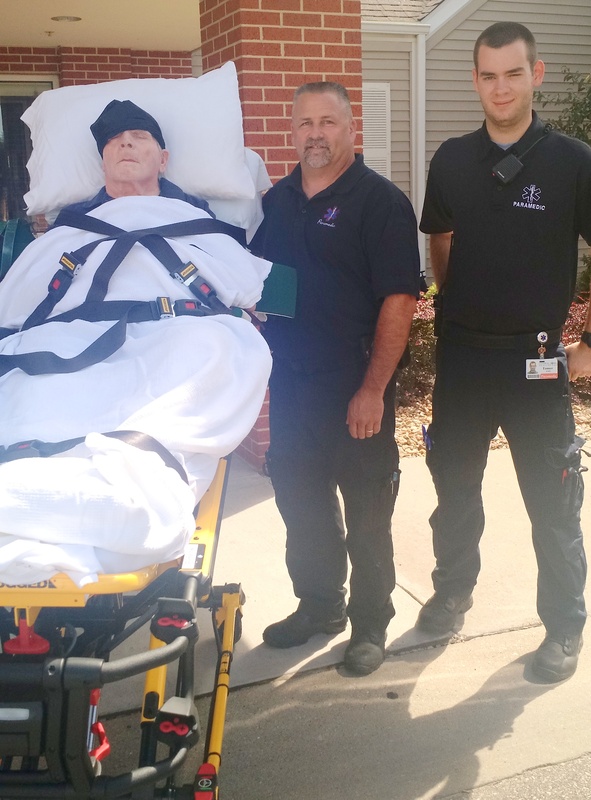 “It’s nice to know there are still good people out there and this act of caring shows what kind of people they are,” Christine says thinking of the staff at Care Initiatives Hospice, Southridge Specialty Care, and the staff at Toledo Ambulance Service.